Finally I can claim that I can Bake! I was very very VERY inspired to try to bake after seeing Diana of Domestic Goddess Wannabe posts many of her fabulicious cakes. I was at Phoon Huat to gather some ingredients and a 10" baking tin made its way into my basket then eventually into our house. Its been sitting at that corner in the kitchen for the pass 2-3 weeks before I gathered enough courage + did a lot of home work to make my first real bake. I have baked 4 cakes in the pass week, very happy and satisfied with myself. 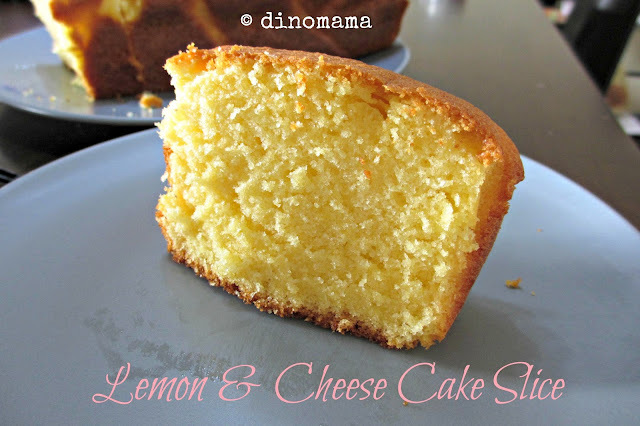 I flipped through my baking books and decided to try this real simple cake, the Lemon & Cheese cake. I was keeping my fingers crossed and hoping with all my heart that the cake will turned out well. After a heart stopping 20mins, I was thrilled to see that the batter has rose up~ shortly after the buttery aroma of the cake fills the kitchen! About an hour later, the cooled down cake looked wonderful! At first the crack on top of the cake bothered me but a checked with Diana confirmed that it is suppose to be like that. And the family love the cake! I was supposed to put candied lemon ring on top of the cake but I have no idea where to get that so I omitted it. I baked this a second time as it was such a simple cake, this time I put in more cheese then it says in the recipe. 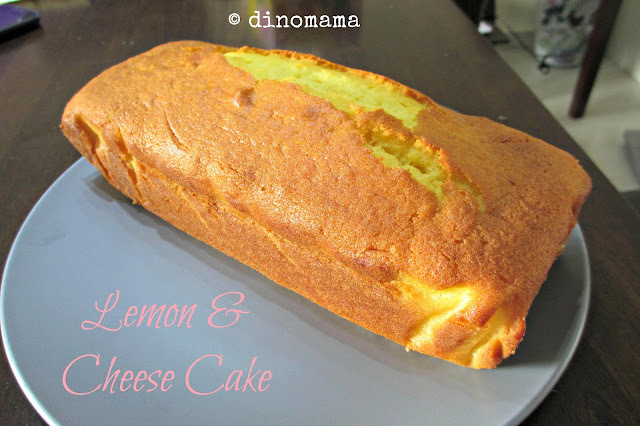 The cake has more cheese taste and we like this version better. I woke up at 4am on one of the morning to bake the Banana & Blueberry cake. There were more steps then the Lemon & Cheese cake, thus took me longer to get it into the oven. Also I used this recipe not knowing that it is for cupcakes instead of loaf cakes, it took extra 10mins in the oven for the cake to be ready. 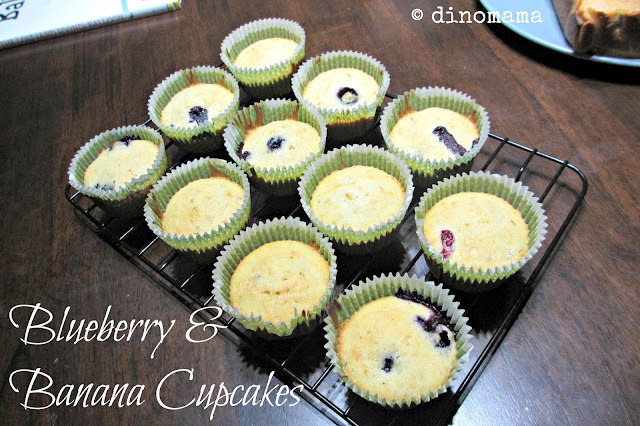 I left some batter to make them into cupcakes as I want to see if there is a different in the taste and texture of both. I like the cupcakes but DinoPapa prefer the loaf cakes, DinoBoy do not like this cake as it's moist and soggy-like due to the banana in the batter. This is the hardest cake I baked last week, more steps and more ingredients. 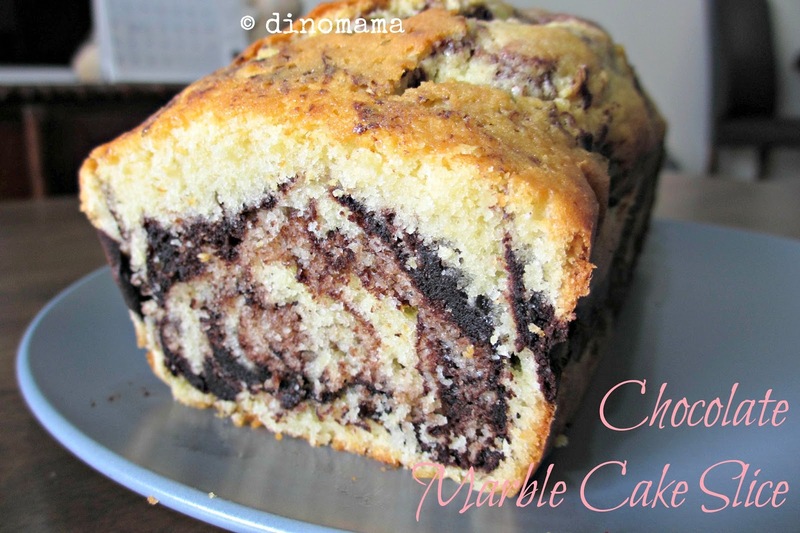 When I saw Diana's post on this Chocolate Marble cake and told myself immediately that I MUST make this! I have to throw away the first batter as I got the mixing sequence wrong, the batter turned out too watery. 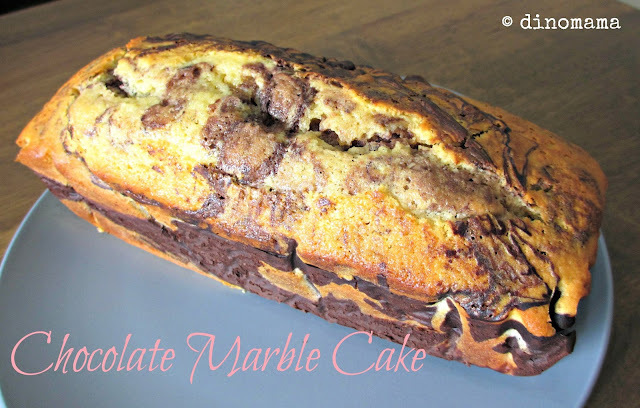 Initially I intended to bake 2 Chocolate Marble cakes but are only able to bake one. 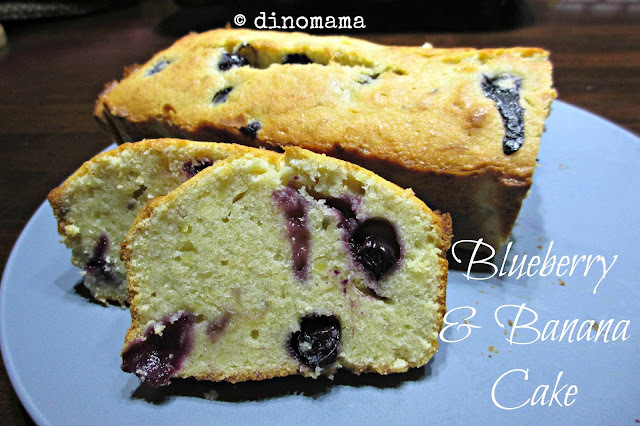 I gave this to my brother, so I do not know how the cake taste like, but it turned out looking good so the taste should be ok.
well done, these look very nice, and a great first forage into baking, look forward to seeing what else you come up with. Oh my! how did you find time to bake so MANY in just a week?! And it looks sooooo nice! You REALLY got going with the baking! I'm impressed you kept trying more and more difficult recipes.